It doesn't happen often that I pick up a book and immediately dive into it. This book is one such exemplar: the narrative is simply gripping, and I just couldn't put it down. It's not suspenseful per se, nor is it a page-turner with plenty of cliffhangers between chapters, but the prose just grabs you and you cannot help it but read further. And funny enough, I also felt the same with the other book I have read from Antal Szerb. And what's more surprising is that the genre of that book and this one are vastly different, yet both books seem to have gripped me quite well, resulting in a very positive reading experience. 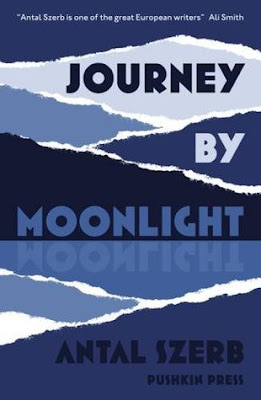 See, Journey by Moonlight reminds me of an 18th century Gothic novel. This book is mysterious, almost cult-like in aura, with characters that have weird psychological traits and behaviours, like this obsession with death. Yes, quite a few characters in this book find dying rather therapeutic. And if you have a mindset like that, then at some point you will act somewhat weird. I won't expand too much on the plot here: it involves the adult lives of several childhood friends. There's Mihaly, the main character, who spent quite a bit of time as a child with Tamas and Eva, who are brothers and sisters. They liked to act, the three of them, with typical scenes involving Eva killing both Tamas and Mihaly. There's also Janos, who is the main competitor of Mihaly, and therefore wants to be better at everything Mihaly does, even though he doesn't really succeed. And there's Ervin, the Jewish boy, who eventually became Catholic, and has a strange relationship with the supernatural and other higher beings. Of course they all grow up, and these childhood dynamics get carried over to adulthood, shaping their relationships with each other. And yes, one of them die. Not due to an accident, but because he thought that dying was the most supreme act one can do. Haven't I told you there's a death cult in this book? Anyway, if you're into Freud, then you will probably enjoy reading this book. There's plenty of symbolism and other connections you can make. It's not quite psychological thriller, but it is indeed very psychological. And I guess what I find most amazing is that I got the same response in comparison to the other book he has written, which was of a very different genre. I take that as evidence that I like Antal Szerb's writing style, independent of the type of book he is writing. I give this book 4 out of 5 stars.